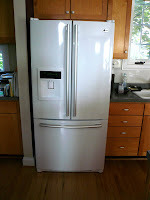 It was finally time to retire the 50+ year old Kelvinator freezer we had in the basement. Nevermind that it worked perfectly well (except for the glacier it would produce in the bottom, which had to be thawed once a year). The unit, being over fifty years old, was probably not the most energy efficient model. Most likely, we'll pay for the new fridge in energy savings over the long haul. We moved the upstairs refrigerator down to the basement, to use as a meat freezer and beverage cooler. The new refrigerator is very nice. It's an LG model# LFD22860SW, 22.4 cu. ft. refrigerator. It's convenient having the French doors, as they allow more space in the kitchen. It's also very convenient having the refrigerator items up on top where they're easier to see and access. Maybe not so many things will get lost at the back of the fridge, as in past days. The unit also has a drawer freezer, which has various sliding bins so things should be fairly easy to get to. I'm pretty sure Becky love the new fridge. Bought and paid for with revenue from adsense! So it's even cheaper. I'm kind of surprised I didn't see an ad for the fridge over on the side. Oh, those ads are there now. Especially if you hit the link for viewing just this article. If you view the main blog page, there's more on vacations, pound-for-advertising-pound. Nice fridge! Let me know how you like the freezer on the bottom. Nice fridge! Our refrigerator in Toronto has the freezer on the bottom as well, and it is really smart. It makes a lot of sense. Just 'cause, we tend to open the freezer most of the time for no reason- it is there at your sight, handy. I learned to open the freezer when it was really needed.